Hermit and WitchMaster gave me permission of translation and a lot of advice as well. I deeply thank them very much for their maximum support. This document is mainly based on WitchMaster’s one and I attached Hermit’s descriptions to it. Besides, I added some footnotes and a little discription (if [W] is shown at the end of footnote, it is written by WitchMaster, and the rest is by me). I was much amazed and impressed at the singular style of the manual by WitchMater, who told politely us about C64, SID, and music trackers, or what we wanted to know. Therefore I introduced and translated this. There are few detailed manuals for “brand-new” software appeared from the demoscene. 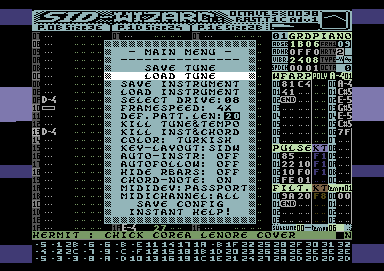 Besides, of course I must mention SID-Wizard achieves the comprehensive composing development environment and high level of completion in the history of music tracker for a quarter of a century. I have learned high-motivation and deep thought from Hermit. Certainly for us, we, people live in Japan, may feel difficulty of operating “the native tool,” which is supposed to be used on real C64. But it could be surely gotten over. And I believe SID-Wizard is a strong release worth getting over the barrier. Moreover, this manual is usable for using and understanding “music tracker,” which has been one of main music tools in the West since the appearances of Soundmonitor in 1986 and Ultimate Soundtracker in 1987. 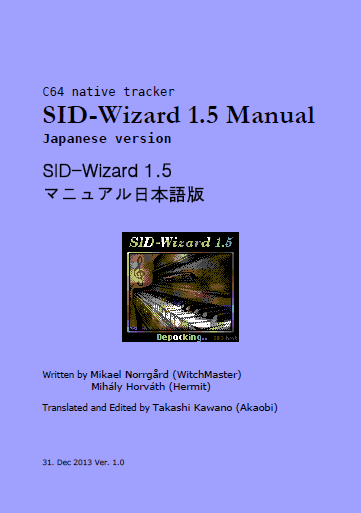 Due to the wonderful gift of SID-Wizard, I hope SID composing would be activated in Japan. Dear mz3364, K->, and osoumen, thanks for receiving my offer upon the publishing of the document. They check and gave me some advice about my translation. As a mark of respect for Hermit, I publish this document under public domain. I would like to devote this document to Little-Nero, who was an early GoatTracker user/musician in Japan.